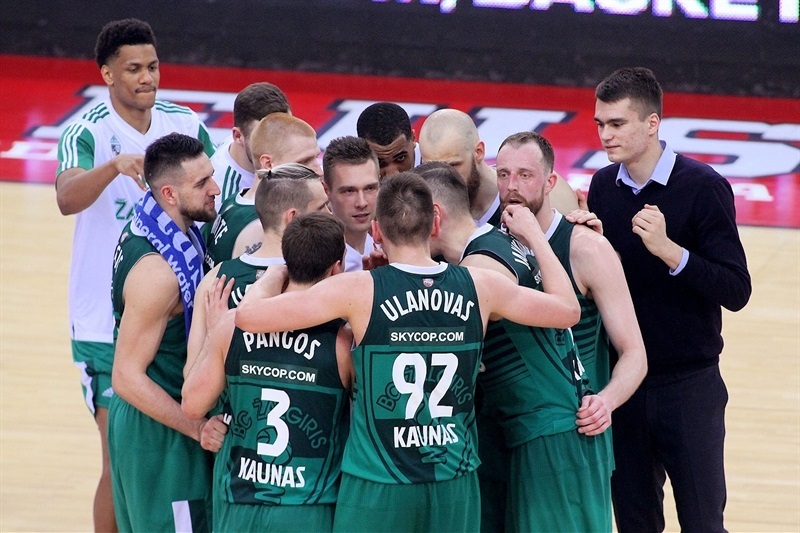 For its historic first EuroLeague Payoffs victory this century, Zalgiris Kaunas launched a spectacular comeback to earn a famous 78-87 road win over Olympiacos Piraeus in an exceptionally hard-fought and intense overtime thriller on Friday at the Peace and Friendship Stadium. 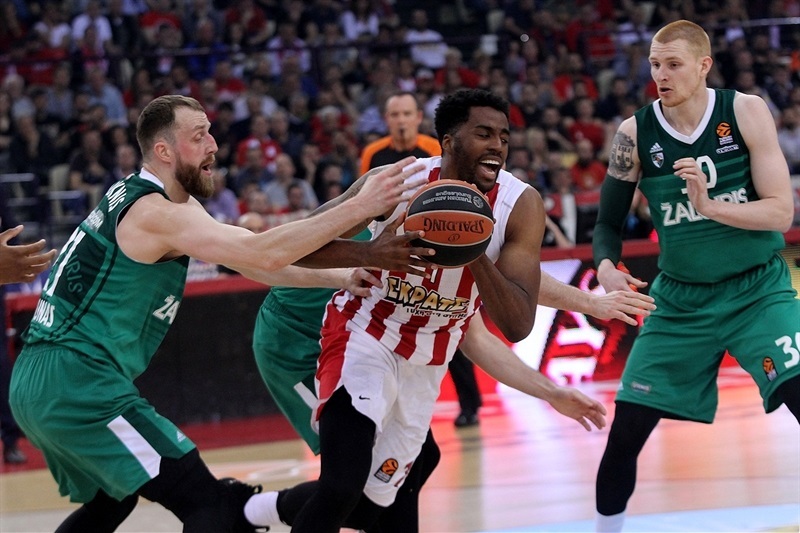 Olympiacos flew to an early 23-8 lead but Zalgiris gathered its composure to fight back, briefly taking the lead on four occasions but never able to move clear. 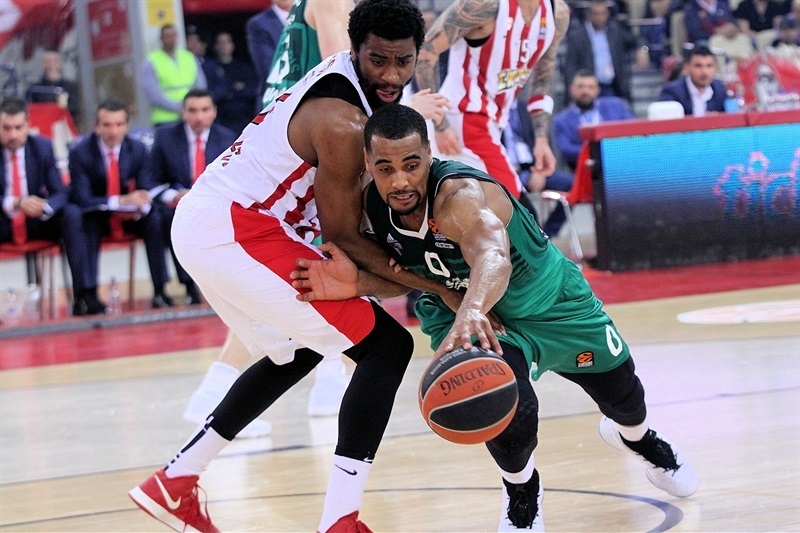 A three-pointer from Vassilis Spanoulis forced overtime but the visiting team dominated the extra period, finally surging to victory behind a spectacular Brandon Davies, who combined 21 points with 8 rebounds and 3 blocked shots. 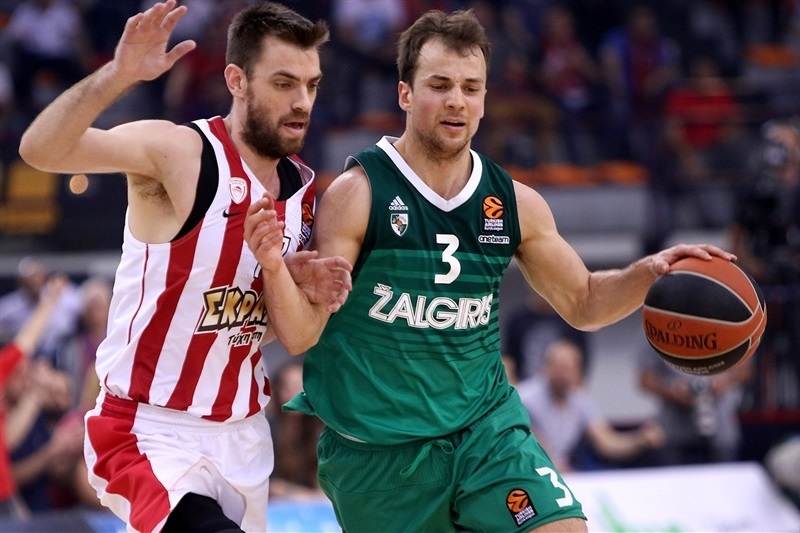 There was also a big contribution from Kevin Pangos, with 20 points and 6 assists, while Arturas Milaknis made 4 three-pointers in his total of 16 points. 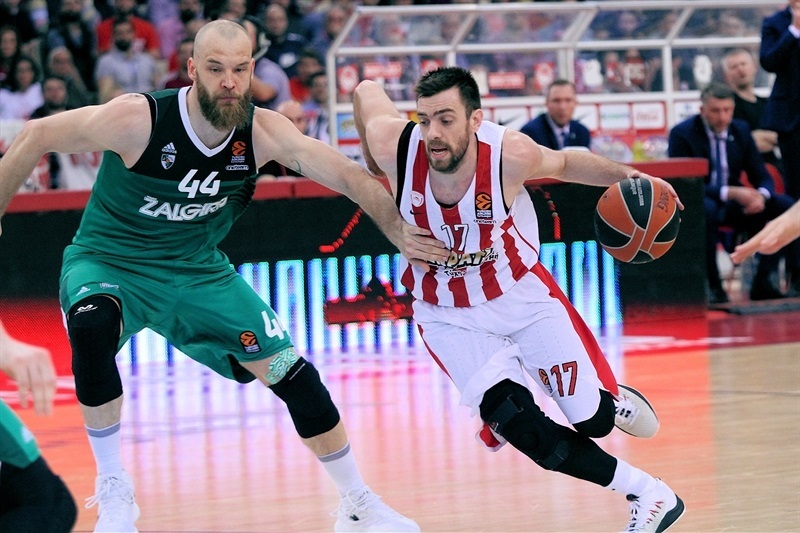 The home team was paced by 21 points – including 5 triples – and 9 assists from Spanoulis, with Georgios Printezis adding 12 points and Ioannis Papapetrou scoring 11. The teams meet again in Piraeus on Friday for Game 2. 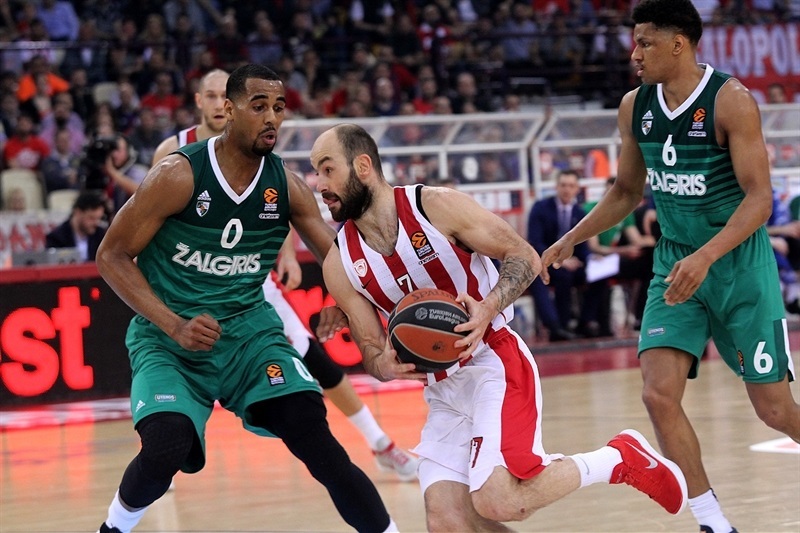 Defenses were on top early on, before back-to-back layups from Brian Roberts and Spanoulis gave Olympiacos its first lead. A triple from Papapetrou capped a 7-0 run before Davies scored a tough layup. A long two from Spanoulis, a dunk from Papapetrou and Nikola Milutinov's close-range finish extended the lead, before Davies netted again from mid-range. Kim Tillie hit a corner three and Spanoulis made a steal to score for a 20-8 edge. 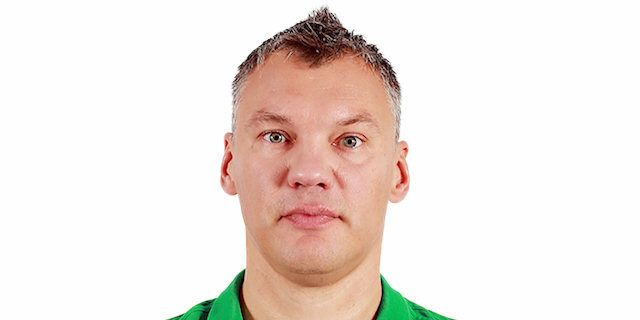 Vangelis Mantzaris added a three-point play, before Zalgiris free throws made it 23-12 at the end of the first. Milaknis opened the second quarter scoring from close range, and Vasilije Micic drove to layup for a 0-8 run. 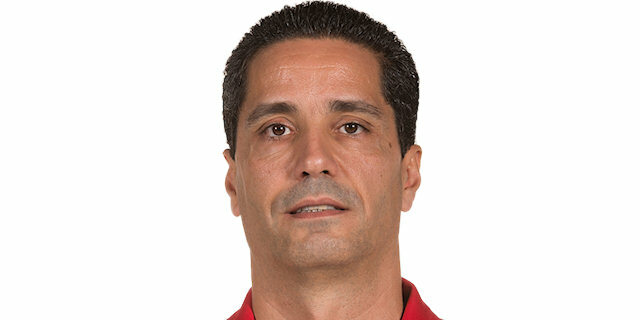 Printezis scored twice in quick succession to restart Olympiacos, but Pangos hit a triple to reduce the deficit to 27-21. 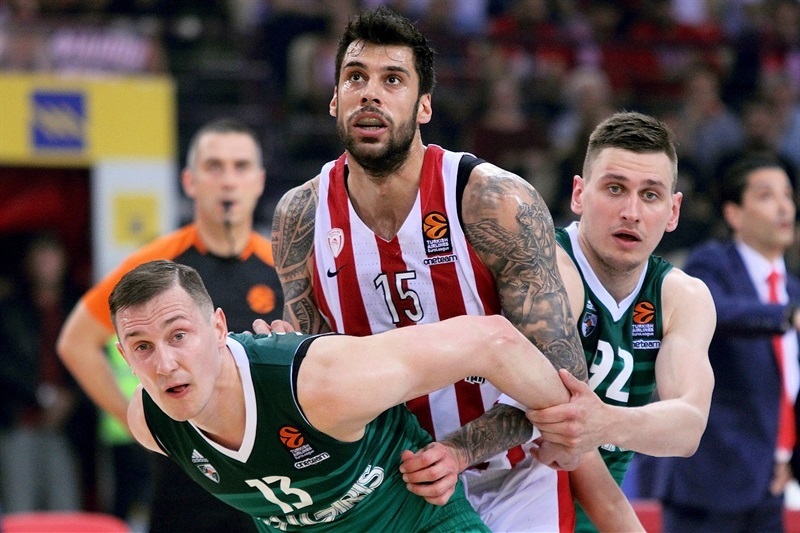 Printezis hit another shot but a Milaknis three-pointer maintained Zalgiris's charge. 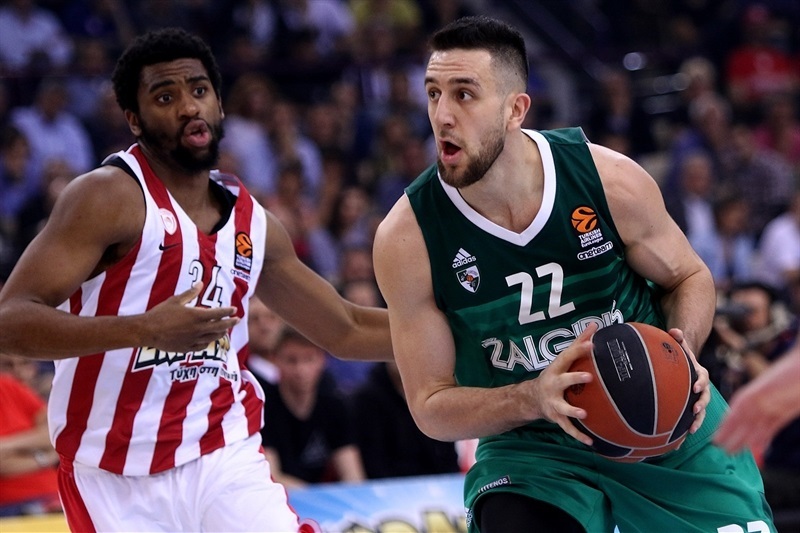 Beno Udrih's jumper made it a one-possession game, and a triple from Aaron White briefly tied the game before Spanoulis nailed a pair of clutch triples for a 38-32 halftime lead. Davies laid up at the start of the second half before Spanoulis and Pangos exchanged triples, then Milutinov and Micic did likewise from close range. 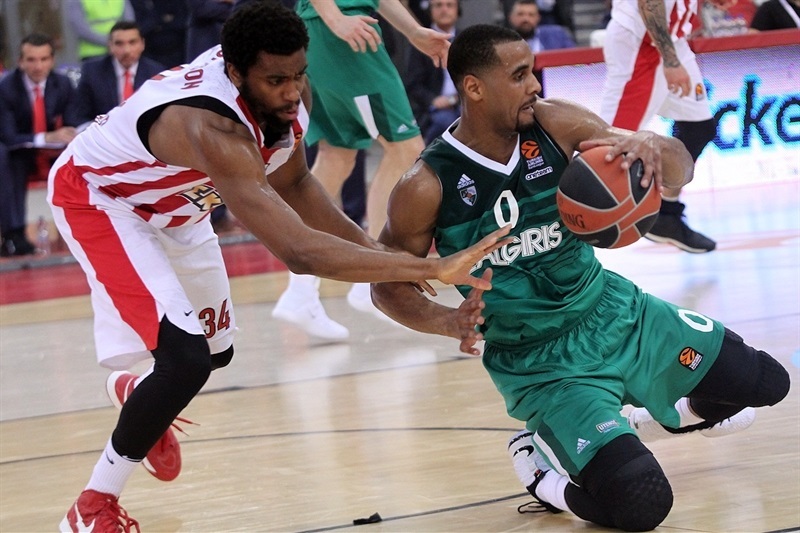 Roberts and Micic traded two-pointers, and Zalgiris went ahead, 45-46, when Pangos struck another triple and Davies converted an offensive rebound. Roberts split free throws to tie it and Mantzaris restored his team's lead from deep, followed by Spanoulis nailing his fourth triple. Printezis added a fastbreak layup to complete a 9-0 charge for a 54-46 edge, but Zalgiris came right back again with free throws and a corner three from White, and the third quarter finished perfectly poised at 56-53. Pangos made it a one-point game with a jumper, before Jankunas blocked a shot at one end and laid up at the other for the lead. 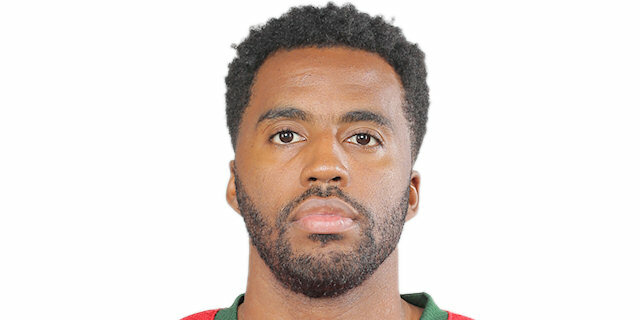 Again the advantage was short-lived, though, as Mantzaris connected from deep, and an unsportsmanlike foul on Davies allowed Jamel McLean to stretch the lead with 4 free throws. Milaknis made another triple before a tense scoreless phase, ended by Papapetrou's floater for 65-60 with 5 minutes remaining. Pangos tipped in an offensive rebound and one, and an unsportsmanlike foul on McLean saw Milaknis tie the game from the foul line before Micic split free throws for a 65-66 edge. Spanoulis then made foul shots to send the home team back in front, and a long two-pointer from Papapetrou extended the lead. 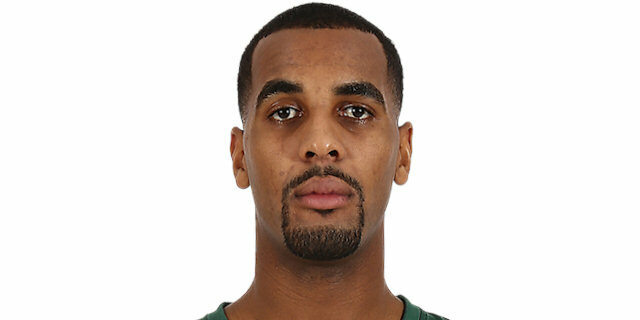 But Davies scored from an offensive rebound, Edgaras Ulanovas split free throws to tie it at 69-69 with a minute to play, and Milaknis made a corner three for another Zalgiris advantage. 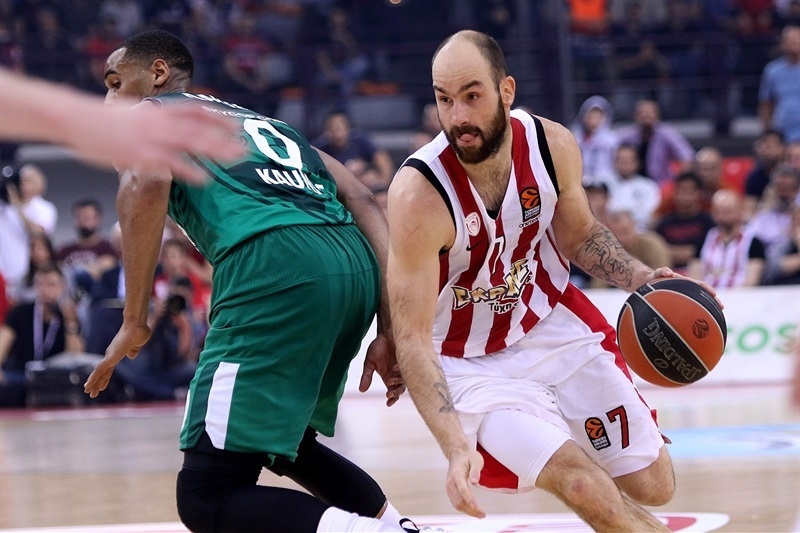 But Spanoulis struck another triple to tie it, forcing overtime. 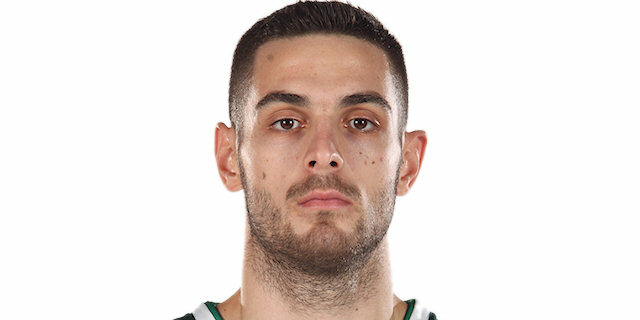 Papapetrou opened the extra period's scoring but Milaknis responded with his fourth triple, and Pangos made it 74-77 with a mid-range jumper. Printezis narrowed the gap with a layup, but Ulanovas nailed a key triple for a two-possession lead. Pangos added free throws to make it 76-82 with 100 seconds remaining, before Spanoulis made it closer from the foul line. 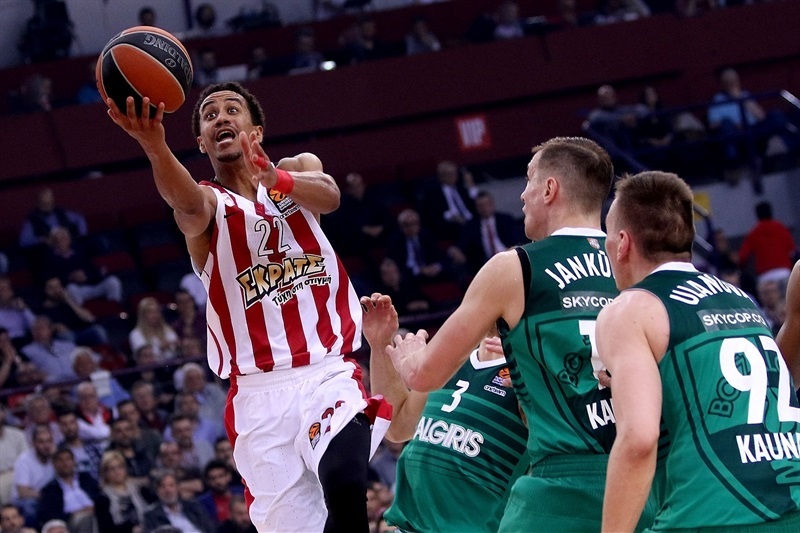 Jankunas floated in a tough left-handed shot, Spanoulis missed a triple and Davies scored a layup and one to seal the deal to the jubilation of the visiting bench.